Rude Health would have liked to take the credit for making this drink delicious, but the truth is that nature did all the work on this one. Its rich, sweet flavour comes from roasted Italian tondo gentile hazelnuts, the best in the world. Its silky texture comes from a little rice that they blend into the mountain spring water. It’s as close as you can get to perfect hazelnuts in liquid form. 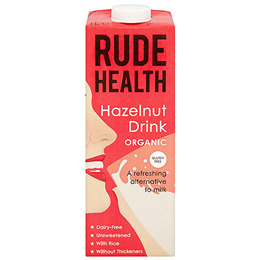 Below are reviews of Rude Health Hazelnut Drink - 1 Litre by bodykind customers. If you have tried this product we'd love to hear what you think so please leave a review. Its rich, sweet flavour comes from roasted Italian tondo gentile hazelnuts, the best in the world. Its silky texture comes from a little rice that they blend into the mountain spring water.